One storey hangs precariously over the other at this isolated hilltop house in Australia by architects Denton Corker Marshall. 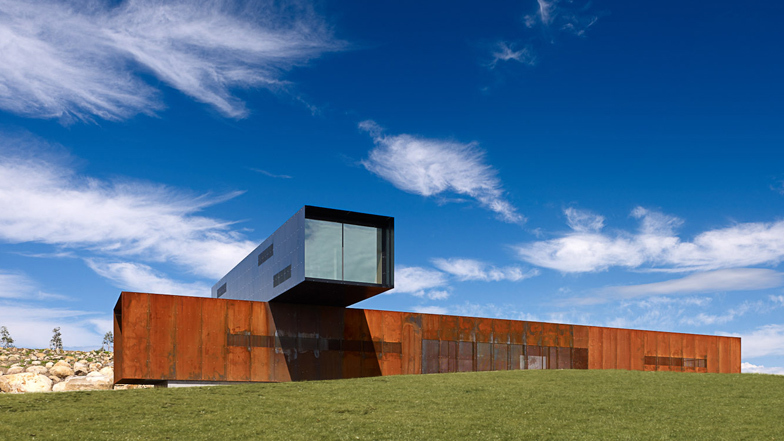 The dramatic cantilever defines the silhouette of View Hill House, which looks out over the Yarra Valley winemaking region of Victoria. The exterior of the lower storey is clad in pre-rusted steel and the upper storey has walls of black aluminium. Chunky chipboard lines the interior walls and ceilings of both levels and the floor of the upper storey, while the lower storey features a polished concrete floor. Denton Corker Marshall also recently unveiled proposals for a visitor centre at Stonehenge in England. Photographs are by Tim Griffith. The Yarra Valley was originally settled as a series of farms strung out along the tracks through the valley on either side of the river. Yering Station and Gulf Station, for example, still exist as heritage buildings, but View Hill is identifiable only as an isolated hill abutting the historic Yarra Track with magnificent views of the whole valley. The 60-hectare site was progressively developed as a premium cool climate vineyard from 1996 to 2004 and now has around 32 hectares of vines. A site for a house was identified at the top of the hill looking north over the vineyard but also taking in view all around. Denton Corker Marshall have completed six houses over the last 20 years, a sideline to their larger building work but seen as an important part of their exploration of ideas about architecture. There were also opportunities to consider the isolated building in the landscape as ‘land art’. Here on the top of the hill the house is reduced to two sticks placed one on top of the other ‘dropped’ onto the landscape. It is a counterpoint to their Phillip Island house of 20 years ago where the house is buried in the sand dunes. The stick sitting on the ground is made of rusting steel whilst the stick sitting on right angles on top and cantilevering impossibly is made from black aluminium. The sticks read as very thin metal tubes with glass inset at each end. The reading of the tubes is reinforced inside by their lining with a grey green stained OSB board – on the upper level its walls, ceilings and even the floor is lined – at ground level the floor is charcoal polished concrete. The ground level tube is 6m x 4m in cross-section so that the ceiling heights are 3.2m, the upper tube is 4m x 3m with 2.4m ceilings. Ground floor uses are centred around a living, dining, kitchen space – with bedrooms at either end. Upstairs two offices and another guest bedroom complete the primary spaces. Planning is therefore very simple – presenting controlled views out from each end of the tubes and then by raising three panels on the side of the lower tube so that the living area looks out over the vineyard. The mountains containing the valley on all sides offer a dramatic backdrop.